We had lots and lots of fluffy white snow over the last week, and were pretty much snowed in over Christmas. The white stuff covered the entire landscape and covered the branches of the bare trees too. The falling temperatures and the ice rain that followed froze pretty much everything in sight including the snow covered branches, and we felt we were in one of those picture postcards of a winter wonderland!! Sleigh bells ringing, reindeer, hot chocolate, and all!! Ahh Christmas!! Back in the day when we were still in school, Mum made yummy tiffin every day. I still marvel at the thought that she would prepare such a variety of tiffin for us early mornings, before we all rushed to catch the school bus. One of my favourite packed lunches was pohe. And while regular pohe (North Indian style) with onions, potatoes, and cilantro was a regular on weekends, Mum would make delicious Tomato Pohe or Peas Pohe for tiffin. A simple recipe for a quick lunch today. Though asparagus is a seasonal vegetable, we sometime also get it around the festive period. I love asparagus and if I see it I just can't resist buying it. Usually we eat it sauteed in olive oil and butter with lots and lots of garlic. But sometimes I also make Indian style recipes with it. Asparagus Pepper Rice is one of the easiest ways to use asparagus and any left over rice. It is a great add on item for a family lunch or dinner. Its that time of the year again when we are busy, busy, busy in the kitchen cooking up delicious festive treats. I mostly end up making fried treats in the run-up to the festivals. This year I am out of town and in India where it is incredibly hot!! So I am trying to make treats that involve less time in the kitchen. Baked Savoury Crackers are the perfect treat when you don't what to stand over the kitchen stove frying up Mathri or Nimkis. Prepare the dough in the cool environment of your dining room, cut the crackers and set them on a baking tray, set the timer and relax!! 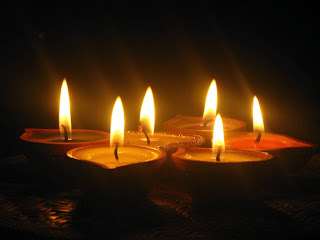 Annarasa ~ Essence of Food, my flagship food blog has been on the web for 7 years and I recently wrote my 400th post on it. 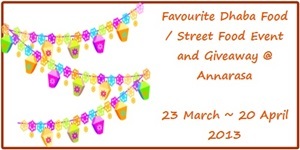 To celebrate this milestone, Annarasa is hosting some food events and giveaways over the next few months. 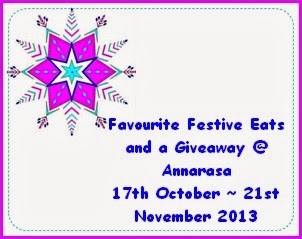 Celebration is the keyword and as we are right in the midst of the festive season, I would like to invite all my readers, friends, and blog visitors to join me in preparing some of their Festive Foods and entering a giveaway right here on Annarasa! Back in the day when we lived in Mumbai, Sundals featured heavily on the Navratri menu. Delicious warm salads made with lentils or beans, seasoned with asafoetida, curry leaves, chilies, and freshly shredded coconut. After moving away from Mumbai, I pretty much forgot about these power packed protein rich salads. Then I came to know a great family that celebrated Navratri the traditional way complete with a new Sundal recipe each day!! The first time I tasted Thattai was at a South Indian grocery store in my city! Crispy, crunchy, and a tongue tickling blend of spices just made it my instant favourite. Every time I head out for groceries I had to buy myself a batch. Back home I'd make a cup of hot tea and we would crunch them until they finished. One day I asked the owner of the store what exactly they were made of and she very kindly gave me the recipe. Since then, I have always made Thattai at home. Not because I did not like the one from the store, but because once you munch one Thattai you cannot stop. I decide that if I really was craving them then I could make them. If not, no unnecessary munching of snacks just because of a visit to the store!! Fried rice recipes are so easy to put together. A well spiced fried rice dish tastes wonderful warm or cold and makes for a simple and flavorful recipe for a packed lunch or a picnic lunch. Though fried rice recipes are often made with leftover rice, I love to make them with fresh rice too. They make a great one pot meal for lunch or dinner and then if I have any leftover I use it for the lunchbox. If you have an office microwave, you can carry this for lunch the next day too. Kozhukattai is a steamed dumpling. It can be made with pretty much any type of flour but it is most commonly made with rice or ragi. It can also be savoury or sweet. I love kozhukattai in all its forms. I make the rice flour and ragi flour one at home for snacking all the time. I also love making the Uppu Kozhukattai. Its got a moreish texture that adds so much to the flavour. Today I made these steamed dumpling with spinach. The were perfect with some delicious zucchini kootu!! South Indian style lemon rice is probably one of my favourite rice dishes. It is a delight both to make and to eat - the fragrant tempering, the hot and sharp tastes, and the beautiful yellow colour are so inviting! Its also so easy to make that it can be ready in a snap. It is also great to make if you have left over rice from a party or get together. Lemon rice is one of the dishes I love to make when we are planning a road trip or a picnic. It travels so well, tastes delicious hot or cold, and you never have to worry about the accompaniments. Millet is a grain I use quite regularly. I use it as a substitute for rice and sometimes mill it for adding to breads. My last stash of millet finished a few weeks. So off I went to my grocery store, down the organic aisle and to my great surprise - no millet!! Then I chugged off to the local coop - no millet, next came the wholesale organic store - and yet no millet. Oh well, I thought - I'll buy it online. A few clicks later - no millet - no stock anywhere!! Strange coincidence I pondered - all the millet in my part of the world has gone off the market just on the day I need it!! Weekends are for the great outdoors in our part of the world. The short summers and the beautiful autumn weather is best enjoyed walking or hiking in the woods or forested preserves. The greenery, waterways, wildlife, especially the birds make walks - be they short or long so fulfilling that it is almost a shame to spend a single day indoors. Everyone knows alsi or flax seeds are good for you, but how does one eat them? Incorporate them in your baking, sprinkle them on your granola, blend them into a smoothie, or top a parfait. Looking for new ways to incorporate flax seeds into your diet. Look no further. 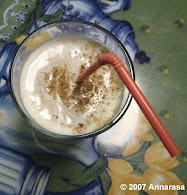 Here is a recipe that is not just lipsmackingly good, it adds major nutrient value to you meal. Simple, delicious Flax Seeds Podi is the perfect accompaniment to idlis, dosas, and of course rice. Just mix it with some warm raw sesame seeds oil (til tail) to a paste consistency and enjoy. By the way, I also love sprinkling this chutney dry over dals, sprouts, and salads. As I had mentioned in a previous post, dal is a staple in most Indian homes and ours is no exception. I am making a lot of dals these days. I love my cup of dal in the afternoon and try to mix it around with a variety of lentils and beans all cooked and tempered in many different ways. Today I am sharing a recipe for a simple mung dal that is tempered with ginger and garlic. With the temperatures diving into the 70s, the weather has turned rather autumnal around here. The leaves on the trees are still green, and there is no fall. But the sunshine seems to have acquired that mellow quality that makes autumn so incredibly beautiful. The flowers are still in bloom and we are seeing a lot of bumblebees, geese, and squirrels!! Its wonderful to enjoy the great outdoors and we have been stepping out every evening to enjoy the longer daylight hours too! That often leave me with a rather short window to rustle up a hot and fresh meal for dinner. Cabbage is a wonderful vegetable. Apart from belonging to the family of cruciferous vegetables, it is packed with beta-carotene, Vitamin C, and fiber! My last visit to the farm yielded some beautiful heads of cabbage, kohl rabi, beets, and cucumbers. I was also able to get some glossy banana peppers and some fragrant lemon grass.But more about those later. 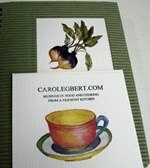 Today I want to share a cabbage recipe I developed for the farm fresh cabbage I got last weekend. Dal is a staple in Indian homes - prepared at least for one meal if not two. As I kid I remember enjoying dal for both lunch and dinner. Moong was our lunchtime favourite and for dinner Arhar or Toor Dal always won hands down. Other dals were always included in the diet and my Mum always alternated between making the wide variety of dals and beans that are available in India. Today I follow this tradition of cooking dal at home. Often I use the pressure cooker as it is perfect to get dals ready in a jiffy. But sometimes I like to soak dals for up to two hours before cooking and then slow cook them in a stock pot on the stove! I have a weakness for peaches. And blueberries are a favourite in my family. So when I manage to get my hands on juicy peaches and fresh blueberries I just cannot resist whipping up some delicious Peach and Blueberry Cobbler! Now this may seem more like a recipe for the autumn, and yes I love baking fragrant crumbles, cobblers, and fruit cakes during the autumn. Its an ideal way to enjoy the last fruit of the summer while welcoming apples and pears into my kitchen. Weekend baking and this time I made Olive Bread. I love black olives and one of the places they add so much flavor is in bread! Typically this would be a white bread. However I prefer not to use all purpose flour in my bread baking adventures. I find whole grain flours add so much texture and taste to a loaf. So I generally try to mix a couple of whole grain flours while baking bread. Today's recipe is a well loved one - carrot puris. A simple fried bread made with multiple flours, grated carrots, and spices. These are good snacking puris and perfect for the lunch box. Kids love them for their chewiness and their taste. I like to make a big batch once in a while and save them in the refrigerator. They will last for at least a week - if you can keep your hands off them. Just warm them in the microwave using a damp tea towel and you are good to go. This morning I baked a Zucchini Quick Bread with some of the zucchini I had picked at the farm. I used my regular recipe - one that I developed after the Daring Bakers once got together to make quick breads! Its a tried and tested recipe and so simple that you can't possibly go wrong with. I used a blend of whole flours that added to both the taste and texture of the bread and threw in some sesame seeds and flax seeds for good measure! appearance, people rush out to but these tender treats and make fresh pickles with them. Fresh pickles are generally made with raw ingredients and seasoned with spices and a little oil. They are meant to be eaten with the meal for which they are prepared. Sometimes they may be kept in the refrigerator for a day or two but no more. The June 2013 Daring Bakers Challenge was to make a delicious pie - four kinds of pies were offered up by Rachael from pizzarossa. I chose to make a fairly straightforward Jam Tart or Crostata di Marmellatta. I began with making an egg free Pasta Frolla or Basic Italian Pie Pastry. For the filling I used some fresh home made strawberry preserve delicately flavoured with Italian Lime Juice!! Healthy eating is a challenge no matter where you live, what you do for a living, and even how organized you may be. Indeed it takes a real effort to evaluate our eating habits and begin including healthy foods in our diets in uncomplicated and tasty ways! Ways that will encourage our families also to enjoy them both for their nutritive value and taste. Given the above, and I know this from my friends, it can be time consuming to hunt healthy recipes. In March of this year, Priya @ Mharo Rajasthan announced an event that goes some ways to make our lives easier. Healthy Me and Healthy Us is a food blogging event that not only encourages us to include healthy, fresh, and whole foods in in our diets, it also provides a forum wherein we can share our recipes and discoveries of nutrition adding foods that are really good for us. 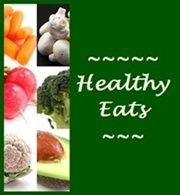 It is with great pleasure that I announce the July 2013 edition of Healthy Me and Healthy Us at Annarasa ~ Essence of Food. I hardly need to say this but I love peanut chutneys. I am always experimenting newer ways of making delicious chutneys by incorporating peanuts. Last week it was frightfully hot around here and we were enjoying only cool meals every evening. The day I made my Creamy Cucumber Curd Rice recipe, I also made this simple yet yummy chutney to go with it. Perfect combo - they simply tastes superb together. We are getting tons of blueberries around here. Fresh, sweet, sometimes tart, but always delicious. We love snacking on berries in the summertime and blueberries are no exception to that rule. Last weekend, I was able to lay my hands on the most beautiful blueberries at our local market. We ate our fill of them for dessert and then I began to think of ways to use them in baking. There are times when I like to make subzi without any chili powder or green chilies. Just flavor with whole spices, garam masala, tomato, garlic, and cilantro, and you get the most wonderfully flavorful blend!! Today I am adding just such a recipe to my food blog - Subz Korma or North indian Style Vegetable Korma. This dish is not only delicious, but also nutritious and perfect for little ones. I have always loved granola and Swiss style muesli - they are the go to breakfast or even snack for me. Until some years back I would always have a box both in my pantry. Then I started making oats for breakfast and I came to love porridge with warmed milk, honey, and fruit. Cooked oats are especially great on cold winter mornings - hearty, filling, and so tasty. We were suddenly faced with some rather inclement weather last week - rain, thunder, storms, and high winds!! It was pouring for 2 days straight which sent the temperatures tumbling. I decided we needed some good hot soup to make up for the chill. As were not in the mood for any creamy and heavy stuff, and I was clean out of tomatoes (tomato soup is my favourite), I decided on some sweet corn soup Chinese style. It never sits on the stomach but can fill you up too. As I got the ingredients together I realized that it has been ages since I made this soup. Luckily I had saved a tin of creamed corn in my pantry just for such a moment!! The one biscuit that I came to love from my time in England is the English Digestive. Ubiquitous yet unobtrusive, this most English of biscuits has found a place in the heart of many a visitor an local alike. The story of the English Digestive goes something like this: Known originally as a Wheaten, this sweet meal biscuit came to be called a 'digestive' as the use of sodium bicarbonate in the recipe led people to believe that the biscuit had antacid properties. Though records of its existence in England go back to the 1870s, it is believed that such brown meal biscuits were sold by English bakers from the 1850s! Summer is here and its time to make salads. I love shopping at our local farmers' market for fresh organic produce. Starting May the market is outdoors and so the pleasure of visiting it just doubles. The sunshine and vendors with bright flowers, fresh fruits, herbs, vegetables just makes shopping such a satisfying experience. Chatting with the farmers who grow the produce and getting to know is a the best bonus that one can ask for. Hello everyone!! The Daring Bakers always come up with the most interesting projects and this one was no different. I have to say at the outset that I loved this challenge and I will most certainly make this cake again and again. Korena truly delighted us with this cake!! With the Memorial Day weekend, the week seems to be going by very fast. Holidays on a Monday always do this to me - by the middle of the week, I am looking up the calendar to check if we are at Tuesday or Wednesday!! Do you feel the same way? Our weekend was quite busy, but we were able to make our first trip of the season to one of our favourite local farms!! I had an email from them announcing that the asparagus was in and though I have been buying at our local store, I was really really keen to get a fresh batch from the farm. So off we went - and I am so glad because we were lucky enough to find some early rhubarb too!! I got a good batch of each and I will be penning down the recipes for both early next week!! I have received many queries in my mailbox about the bright green chutney photographed with the Theplas in the previous post. So here is the recipe. We usually carry Theplas on road trips or picnics. As a rule I prefer not to carry any condiment with them as it tends to get all messy in the car. However this time I decided to make my favourite thick chutney to go with them. We enjoyed the theplas and chutney at a beautiful wayside rest stop with strong sugary tea that I had carried from home in a flask! Thepla is just one on those eats that is not easily available in our neck of the woods. I do try and get a fresh batch of Thepla whenever I visit Chicago. However I have found of late that I am not satisfied with the quality of the theplas available both over the counter and frozen. Even our favourite mithai shop (indian Sweets Store) has disappointed. I did make theplas quite often some years back, but have not been able to do so in recent times as it can be a time consuming exercise. In fact, today is the first time I am making them again in a couple of years!! Calzones make for a hearty and filling snack in a picnic basket or an entree for a meal on a hot platter. I love making calzones as they are so easy to put together, can be refrigerated for up to three days and taste super hot or cold!! Just add a salad and a cup of milk and you are good to go. Chayote Squash or what is commonly known as Chow Chow is not a vegetable I was familiar with in my childhood. I don't remember seeing Chow Chow in a big vegetable markets in Delhi, though I am sure some smaller vegetable vendors might have carried it regularly to customers accustomed to using it. I remember eating a lot of Doodhi (Bottle Gourd) and Karela (Bitter Gourd) but Chow Chow was never on our platters. So it comes as a sort of irony that today I can buy Chow Chow in any supermarket or farmers market I visit, but I get to see the best quality Doodhi and Karela only in season at my local farm.